It would be great to have out of the box support for realm database. Supporting Realm would likely gain even more preference on Expo. This should really be implemented. Please support Realm, please, please, please! Uff, sería de mucha utilidad que se implementara la interacción con REALM. With realm, we can improve this step, and expo really will worth. Expo will be the best with Realm! I can't believe realm is not supported by expo! Expo is easy to use, but I can't use it without realm! Please add it! I can't use Expo without realm! plz!!! please add realm, I had to eject expo because of this. FYI, after CRNA turns full Expo. It also breaks the support for using Realm in ejected mode. Release version of Android always crash at launch. +1.please add realm, I had to eject expo because of this. With expo everything is simpler and easier for react native developer. So realm should be integrated with expo. We'd love to see Realm supported by Expo. I've noticed Realm slows when the Chrome debugger is activated but I'd imagine that's an exception. Surely that can be worked out. Who could help the Realm team ensure their DB remains performant when the debugger is activated? This is preventing us from adopting expo. Please consider adding support for it. Please support realm DB!!!!!!!! !We need it!!!!!!!! One more vote for realm here. Clearly, there is enough demand. Please add support for Realm. took me a bit to figure that out. @Adnaan Badr: Thanks Adnaan! This was helpful. @Adnaan Badr: This is awesome, thank you! You deserve a medal. @Adnaan Badr: Thanks! Are you able to use attachments from pouchdb? I get an error when trying to get the attachment. ..please, it would be the best of the world! Please see https://github.com/realm/realm-js/issues/491 for why in it's current state Realm should not be implemented into expo. 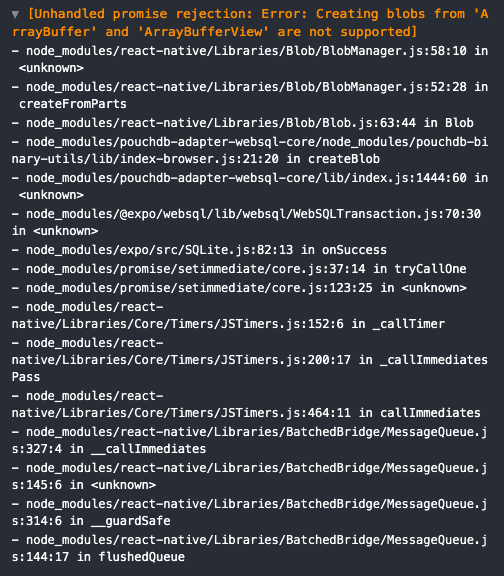 It breaks debugging which is core react-native functionality. Any Updates from Expo team if this is considered to be implemented? we really hate to detach. I like Expo and I like realm. Expo is easy and Realm is easy. They should go hand in hand. Make it happen. You can do it. Realm is very efficient and it would be great to work with Expo. Its been almost a year and 114 voters, isn't this enough to at least give it a try? You have added less important features with less votes than this one. It has been proved to be the fastest mobile db. We recently added SQLite, and you can use PouchDB (https://pouchdb.com/) on top of it. We may add Realm in the future if there is enough demand!